CFC is Chamberlain’s only locally owned and operated grocery store! Our proud owners of 15 years, Dan and Amy Comfert, have turned a business into a family. Our one of a kind management team and friendly staff are always here to help you with anything you need! We are proud to offer a full hot deli, bakery, and the freshest meat and produce in town! 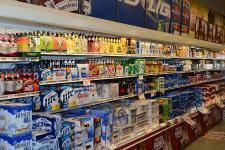 We offer a wide variety of cold beer and liquor at the lowest prices in the area. Delicious sandwiches made fresh daily are available 7 days a week in our deli! We treat our customers like family! We appreciate your business!